We don’t exaggerate in claiming that the guacamole is undoubtedly the most popular dip in the world and therefore there are countless variations of the recipe. In this occasion we are going to mix avocado with Poblano pepper, to obtain a guacamole as good as the traditional one with the difference that it will have a more intense flavor ... you will also perceive toasted notes and to balance all the flavors it is garnished with grated fresh cheese. This guacamole has another interesting point to highlight because it is mixed with parsley instead of coriander. With this herb the guacamole acquires more freshness and a very pleasant aroma. As all the guacamoles this one also serves to accompany your favorite snacks but also consider using it in some quesadillas because the quesadillas’ flavor will be enriched. The preparation of this guacamole is a bit elaborated. As part of the preparation the Poblano peppers are roasted, if you want you can put a fan in the kitchen so it doesn’t fill with smoke. This guacamole is prepared with parsley and don’t substitute it for coriander because the flavor won’t be the same. Put on a griddle over medium heat 2 garlic cloves with skin and roast them for approximately 1½ minutes, until all their sides are moderately roasted; move them regularly with some tongs. Peel the garlic cloves that were roasted, then put them in a blender and reserve. Put on the griddle over medium-high heat 1 tomato and roast it for about 5 minutes, until all their sides are well roasted; move it regularly with the tongs. Remove from the griddle the tomato and wait for it to cool a little. Peel the tomato that was roasted, then put it in the blender and reserve. Discard the seeds and the veins of the Poblano peppers that were rinsed. Upon completion put them in the blender. Separate from 1 parsley sprig the leaves from the stalks. Then finely chop the leaves and discard the stalks, then set aside. Scoop out the pulp of 3 avocados and put it in a bowl; reserve 1 avocado pit. The Parsley Leaves that were minced. Insert in the Poblano pepper guacamole, the avocado pit that was reserved and sprinkle 2 tablespoons of grated fresh cheese. The avocado pit serves to preserve the Poblano pepper guacamole for a longer time. * This guacamole will only last 1 day because the avocado oxidizes quickly. 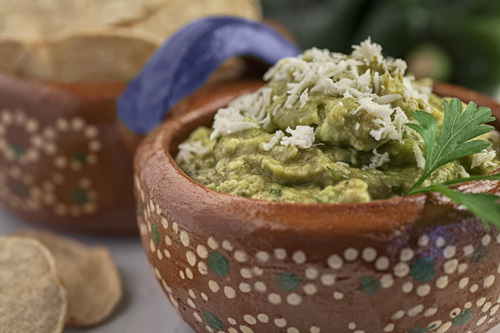 Variations: The guacamole can also be prepared with banana pepper or with manzano pepper. Did you like the Poblano Pepper Guacamole? The best bowl for this guacamole. In this recipe many ingredients will be roast and some good tongs are needed.